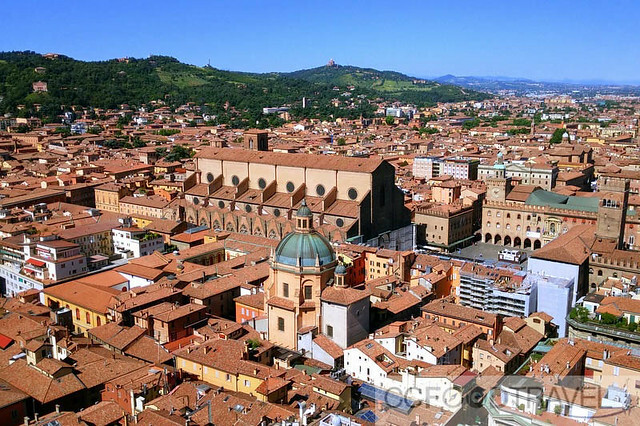 I am currently in Bologna Italy, in the region of Emilia-Romagna, and one thing I noticed so far, is that the Italians love to eat. They eat well, they eat often and they certainly eat huge portions. After a mere 7 days, my Asian stomach is just getting used to it.. almost. And Emilia-Romagna itself stretches from the wetlands of the Po delta down to the beach resorts of the Adriatic coast, and across fertile plains, from which loins great Italian cuisine is produced. This is THE ultimate foodie destination. I must say, 8 years ago I visited Italy but not Bologna, and I wasn’t as impressed with the cuisine as I am this trip. But that warrants a different post all together. 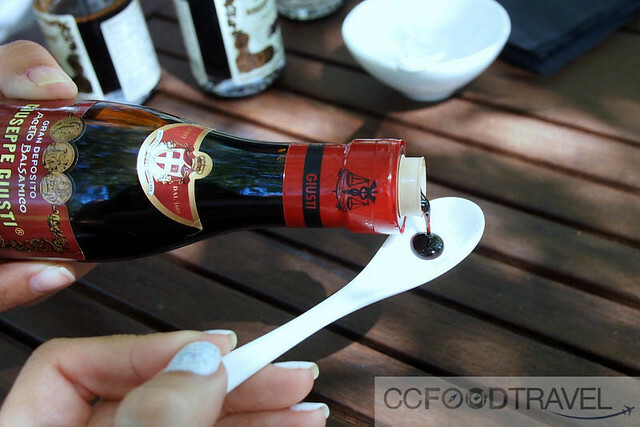 Right now I want to talk about Aceto Balsamico. So, mid last week, a day trip to Modena, around 1.5 hours to the north of Bologna, hometown of Luciano Pavarotti and Ferrari cars and I realised I was in the gastronomic heartland of Italy. 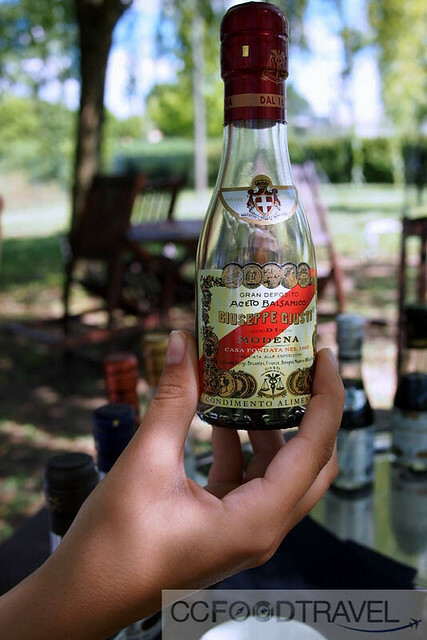 Here, one of the most amazing things is the heritage of the Aceto Balsamico from the precious stocks of families in Modena. 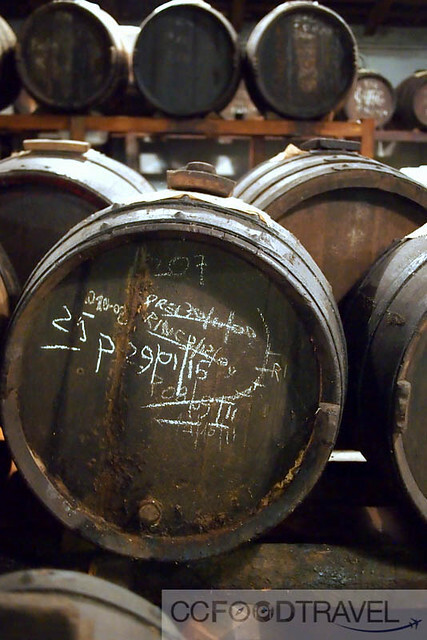 This particular balsamic vinegar dates back to as early as 1046. 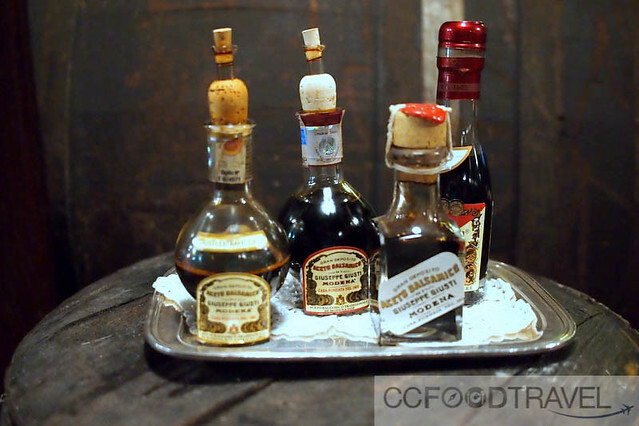 Balsamic vinegar has been used traditionally to alleviate the pain of childbirth, and during the French Revolution it was included in the auctions of luxury goods confiscated from aristocrats. It can be rich and creamy.. sweet and tart and slightly bitter, all at the same time. What it is not, is sharp. Nope. This vinegar has a whole bodied feel about it, that tops any other sort of vinegar known to man, on earth. 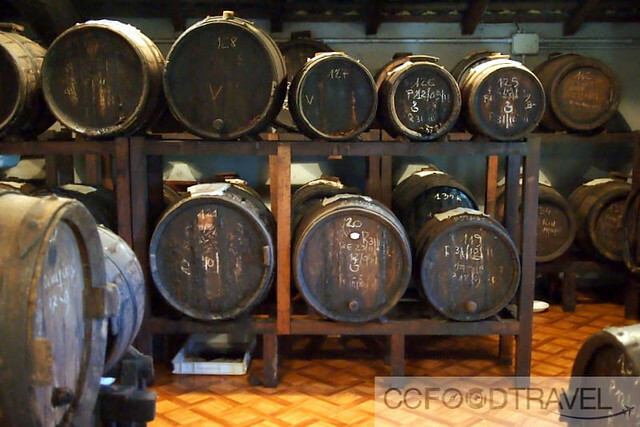 One of the places I had the privilege of visiting was Guisti’s centuries-old vinegar Acetaie (vinegar lofts). 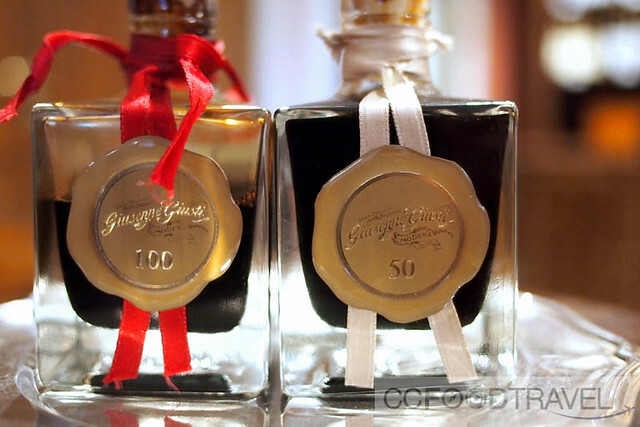 Giuseppe Giusti is the oldest Balsamic Vinegar house in the world, founded in Modena in 1605 and now run the 17th generation of Giusti’s. Back in the Day, Giuseppe Giusti was also a supplier to both the Duke of Modena and many Popes of the Roman Catholic Church. The recipe of the Balsamic is a secret handed down from father to son and is hard to imitate or perfect unless you are within the family. 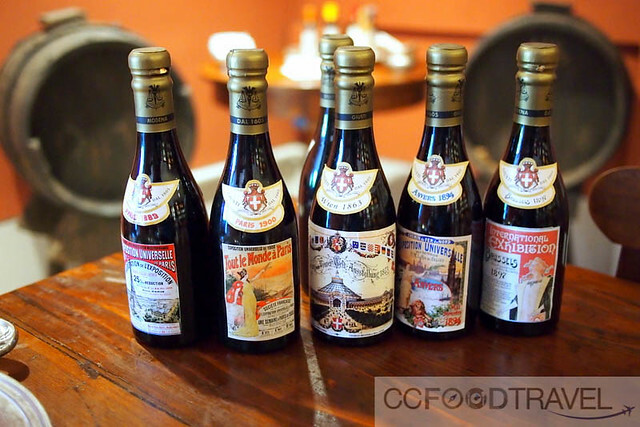 Giusti’s collection of balsamic Vinegars are phenomenal. Stepping into the cellar is a true experience in itself. The cloying characteristic aroma of the balsamic vinegar will hit you like a mini grenade the minute you enter the attic loft. So, I learned that the vinegar is made by boiling the must, or unfermented juice, of white Trebbiano grapes until it caramelizes, which usually happens when it has been reduced to about one-half to one-third of its original volume. The must, is freshly pressed fruit juice (usually grape juice) that contains the skins, seeds, and stems of the fruit. It has a high glucose content is thick, opaque, and comes in various shades of brown and/or purple. Boiled-down must is known as saba. 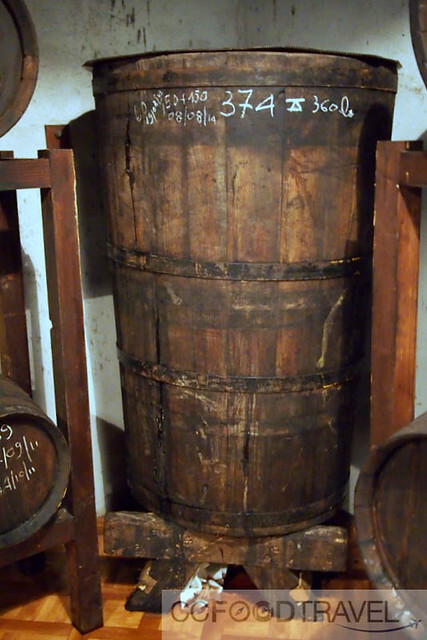 When cold, the saba is poured into a batteria of at least five barrels, each of a different size and made of a different wood; chestnut, oak, juniper, cherry and mulberry woods are usually used. In a typical home batteria, the largest barrel holds 50 liters, the second-largest 40, then 30, 20 and 10 liters. As the must ferments, a gelatinous substance called the mother, forms on the surface of old wine through the action of a fungus. 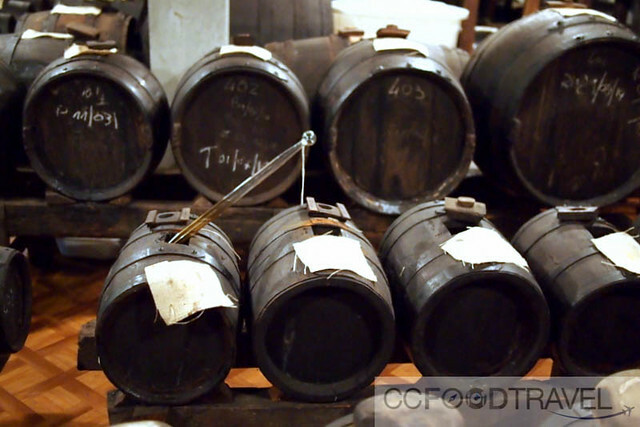 The mother is then added to each barrel, and this gives balsamic vinegar its flavor and quality, ie. it takes on the characteristics of the original parent. 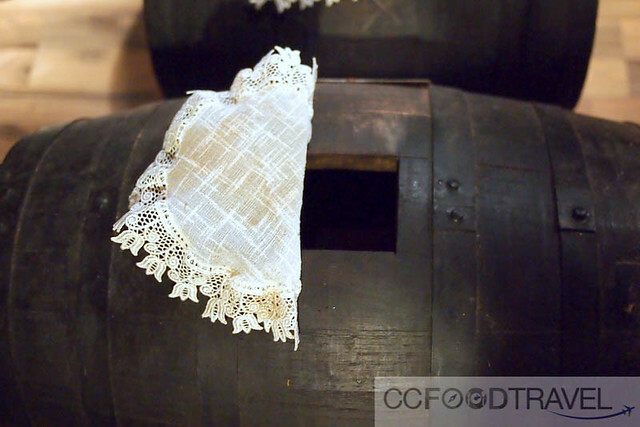 A year later, you will notice a decreased volume, as some evaporates, and some eats into the barrel of the wood – it is after all vinegar, and acidic – you will notice that it can even corrode stone. Stone is sometimes used as a cover for the barrel to confer minerality. Then half of the quantity remaining in the smallest barrel is poured off and this will be used for the coming year. The barrel is replenished from the next largest one, which is in turn filled from the next largest and so on, and finally the largest barrel is topped off with new must. Although you may actually package the vinegar at any point in time, it won’t taste terrific. In fact, it only starts to take on a silky and rich form at around 8 years onwards. The official status of riserva takes 12 years! 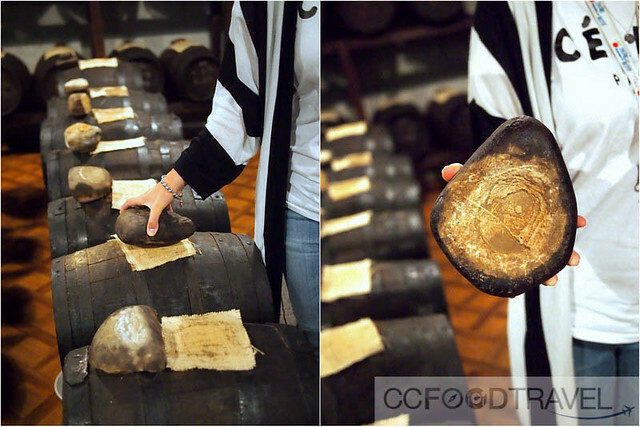 And as for the wood casks, they literally dissolve into the balsamic vinegar giving it’s characteristics to the liquid. 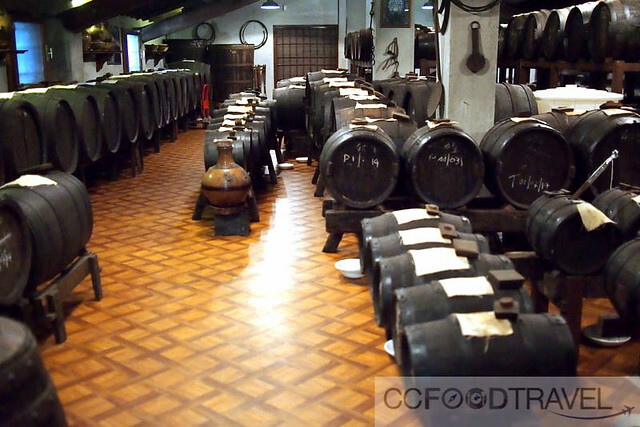 Chestnut wood are rich in tannins and gives rise to the dark color of the balsamic vinegar. Mulberry enhances the concentration, Juniper leaves resinous essences, Cherry sweetens the taste and finally Oak gives a typical vanilla perfume. Complexity is key, and the longer it rests in the centuries old barrels of the Gran Deposito, the richer it becomes in flavors and aromas. If you notice, the labels will indicate ‘tradizionale’ and/or DOC which means, the top end, real McCoy, and will usually be expensive. 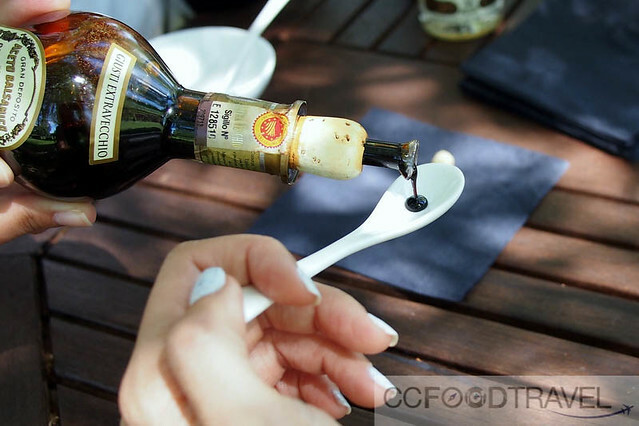 You can also buy the more afforable, industrially made ‘aceto balsamico di Modena’, which uses vinegar as well as grape must, and as it’s not aged for so long, the flavours won’t be as strong. 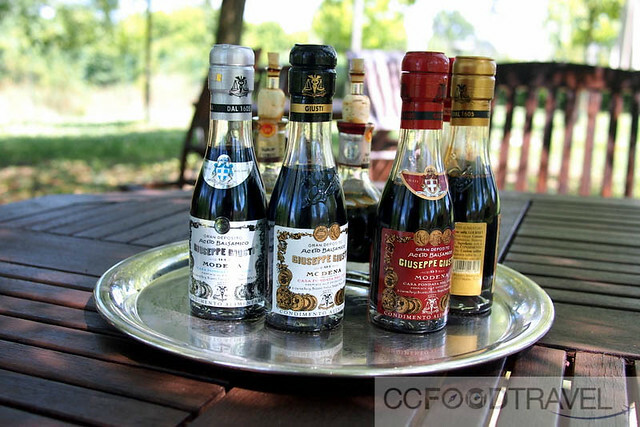 From Classico, ideal for everyday use at home, to the Banda Rossa, a Balsamic Vinegar can be versatile and used for different dining occasions. For example, the tradizionale goes great with ripe strawberries, slices of well-aged parmesan cheese or very good quality vanilla ice cream. 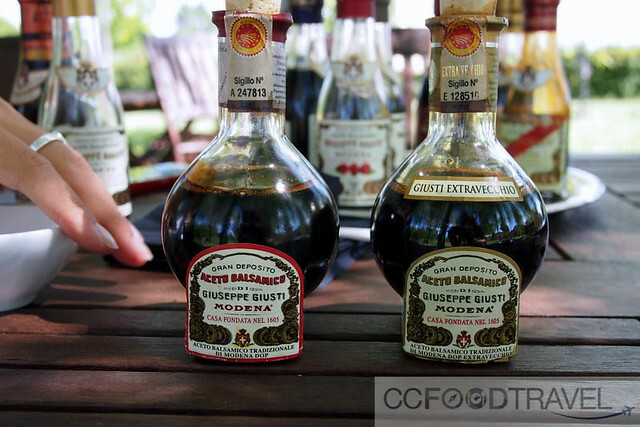 Use the balsamico di Modena over roasting chicken or duck breasts, or even over grilled tuna steaks, drizzle over tomato salads or stir a little into a roast vegetable pasta sauce.. it is suitable for almost every sweet or savory dining occasion you can imagine. The most fun part of this visit would have to be the tasting of course.. it’s strange but the vinegar has a way of settling thirst and the stomach. We tasted in order – 3 medals IGP; 5 medals IGP; White condiment called “Bianco di Modena”; The traditional balsamic vinegar of Modena DOP – the quality called Extravecchio (25 years old) ; Three fruity condiments: raspberry, fig and truffle; Classic glaze; Vanilla glaze; Truffle glaze; and last but not least, the coveted, reserve 100 years old. 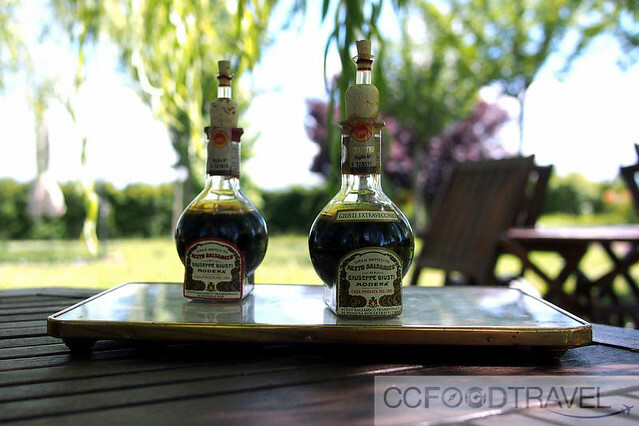 The older the vinegar is, the more top ended and the more expensive. As it ages it takes on a more mellow tastes.. it also gets a lot thicker. Just a few drops in the food will elevate the flavours in any dish. You may use it as a condiment with quiche, potatoes, or vegetables and salads. Use it as a substitute for wine in cooking in marinades and in sauces and my all time favorite, as a topping for strawberries! What an educational day on in sunny Modena.. but Emilia Romagna had many more secrets to divulge to this traveler.. stay tuned for more adventures in Bologna! Note: my trip to Emilia Romagna is part of the #Blogville campaign, a collaboration between the Emilia Romagna Region Tourist Board and iAmbassador. 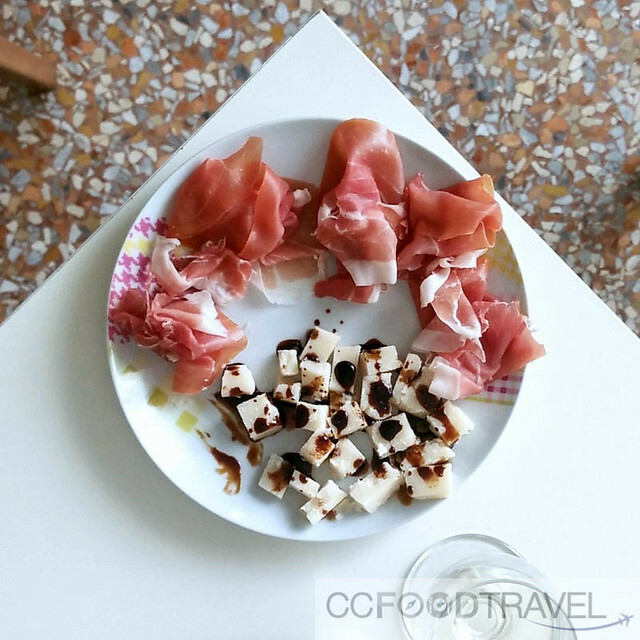 As always, CCFoodTravel maintains full editorial control over the blog. when I grow up I wanna be able to go to Italy too! LOL.. time to go soon then.. !